I welcome the new tools for dealing with antisocial behaviour brought in last month. They will make it easier to control disruptive people and to evict antisocial tenants. But I am nervous the new public spaces protection order could be used to restrict environmental and other protests and demonstrations. I also worry that we won’t have enough police and council staff to implement the wide range of measures introduced under the Anti-Social Behaviour, Crime and Policing Act 2014 (ASB Act). The community trigger looks set to be one of the most useful new tools. In this county, the trigger is called the Shropshire Safer Stronger Communities Partnership Community Trigger Process. Individuals, businesses and community groups can activate the community trigger if they think agencies have not done enough to address antisocial behaviour. To apply the trigger, people must have made three previous reports of incidents of antisocial behaviour in six months. The trigger requires that agencies find a solution to the antisocial behaviour. People and organisations can trigger the trigger, either because they are themselves a victim or on behalf of a victim. The ASB Act agencies says that the councils, police, clinical commissioning groups and housing agencies should all allow applications for the trigger, but as far I can see only Shropshire Council has implemented the trigger locally. The trigger can also be invoked if a single incident of anti-social behaviour or crime motivated by hate has been reported in the last three months and not satisfactorily solved. I am really pleased that the council has made an effort to address hate crime, including homophobic and racist incidents, in its local rules for the trigger. Alongside the community trigger, the ASB Act introduces a new community remedy. This will give victims a say in the out-of-court punishments handed out to perpetrators of low-level crime and anti-social behaviour. After this, there’s an escalating series of measures to deal with individuals and organisations causing a nuisance. The community protection notice is a written warning. Improve your behaviour or you will be fined. 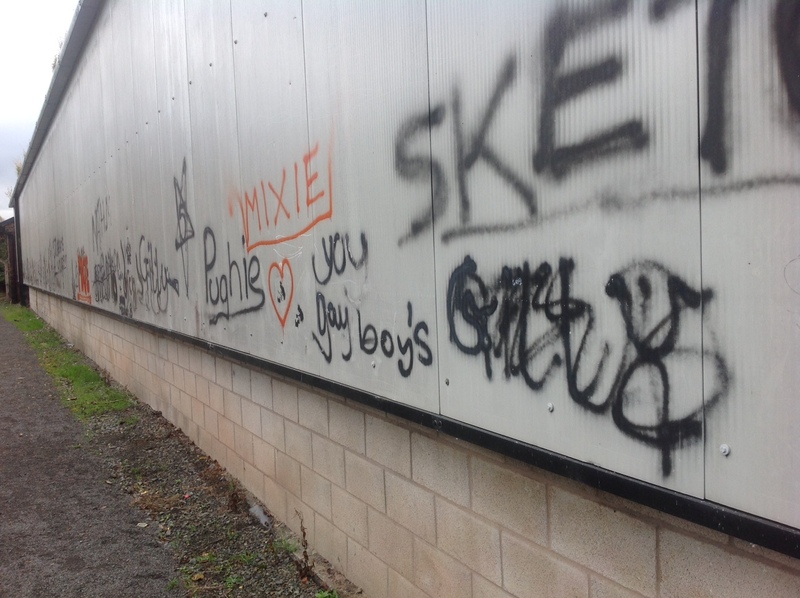 Graffiti, litter, fly-tipping and noise are among the targets for this notice. Some of these offering are covered by the Environmental Protection Act 1990, but that legislation is complex to implement. The community protection notice will be easier. On my reading of the ASB Act, it could be applied to the younger people who screech cars around the town centre late at night, sometimes two abreast. Next up the scale is a new civil injunction which is aimed at a wide range of disruptive behaviours including vandalism, public drunkenness, aggressive begging, irresponsible dog ownership, abusive behaviour, noise and bullying. This injunction has a lower standard of proof than the current antisocial behaviour orders (ASBOs), so will be easier for the police, local councils and housing associations to obtain. The injunction is not just about stopping antisocial behaviour. It will also dealing with the underlying causes. People whose create problems when drunk might be required to attended alcohol awareness classes. Dog owners might be ordered to attending training classes. Other disruptive people might have to attend mediation sessions with neighbours or victims. This injunction won’t deal with the worst cases. For the most serious offenders, a criminal behaviour order can be imposed. Again conditions can be attached, such as attending substance abuse and job readiness courses, or youth mentoring. These measures are mostly deal with individuals and sometimes businesses. But what can be done about groups of people out across the town causing trouble? A new dispersal order will give police and community support officers powers to require people to leave an area for up to 48 hours if they are committing, or seem likely to commit, anti-social behaviour, crime or disorder. Police and councils can also shut premises for 48 hours if they are causing nuisance or disorder. Drug dealers peddling, youths necking back cheap cider, owners of defecating dogs and kids skateboarding are the anticipated targets of public spaces protection orders. They are designed to stop individuals or groups committing anti-social behaviour in anywhere that is regarded as public. The order can be imposed by councils in consultation with the police and others. It will set conditions on the use of an area which apply to everyone. This can include banning dogs from public areas or requiring owners to keep their dog on a lead or pick up dog mess. Drinking alcohol in public places can be banned. Blackpool is reported to be planning to use the orders to clamp down on rowdy stag and hen nights. The public spaces protection order sounds good in principle, but I worry that the way the act is worded allows the order to be applied to demonstrations, including anti-fracking camps and regular protest marches – though I am not suggesting that Shropshire Council would do this. There are precedents for misuse of legislation in this way (outlined in this earlier article). The right to protest, to collect together to protest, to do it repeatedly and to be something of nuisance while doing it, is a fundamental freedom. It should not be restricted by loosely worded legislation. My other main concern with the ASB Act is that is puts a lot of onus on the public and housing sectors. That’s right in my view but given the swingeing cuts to public sector staffing levels, I think we may struggle to implement even a small part of these provisions. Shropshire Council however has made a good start by announcing the community trigger. A detailed guide to the new laws. Help on dealing with antisocial behaviour. Report antisocial behaviour to Shropshire Council or ring the council on 0345 678 9020 any day, any time.